One night, Shri Raama Chandra Murty was taking rest. He put His head on His Parama-mitra Sugreeva’s lap. Bhakta Hanumaan and Angada were doing Paramaatma Paada-seva. Lakshmana was arranging the aayudhams and gaurding everyone. Shri Raama’s drushti was caught by the beautiful Pournami-Chandra. He saw Chandra and said “can anyone of you explain the dark regions in Chandra”. Everyone gave their explanations. They proved their arguments also. However Hanumaan said “Chandra is Parama-bhakta of Nila-megha-shyaama, Mahaavishnu. Since Paramaatma is a Bhakta-varada, He always stays in a Bhakta’s Hrudayam. ‘Naaham vasaami Vaikunthe Na Yogi Hrudaye Ravou. Madbhakta yatra gaayanti, tatra tishthaami Naarada’. Hence it is Shri Raama who is in the Chandra’s Hrudayam. Hence Chandra is able to give Amrutam and Aushadhas to the worlds. This explains the dark region (because Shri Raama is Neela-megha-shyaama)”. Shri Raama had great aanandam seeing the Bhakti of Hanumaan. A true Bhakta recognizes and respects the Bhakti of others, as Hanumaan did for Chandra. A Bhakta also sees Paramaatma in everything, like Hanumaan saw in Chandra. Every one was enthusiastic. Setu-bandhanam was going in full swing. Vaanaras were bringing huge paashaanams (boulders), writing Divya Shri Raama Naamam on them. Nala-Neela were throwing them into the ocean. Due to Shri Raama Naama mahima, the stones floated. In this, once Hanumaan reached the great Indraprastham in search of Parvatams to throw into the ocean and build the Setu (bridge). There He saw a Giri-raaja by name Govardhana. Seeing Hanumaan, Govardhana had paramaanandam. He thought that now is when his body is being of some use. He invited Hanumaan to carry him so that he can be of some help to Paramaatma Shri Raama. Bhakta Hanumaan also was very happy to see the Bhakti of Govardhana. But some duutas (messengers) from Shri Raama came and informed Hanumaan that Setu-bandhanam is over and He can return to the Saagaram. Listening to this news there was no end to the duhkham of Govardhana. He thought due to some paapa-kaaryam he did in his previous janma, he now is not able to serve Parandhaama, Shri Raama. Seeing the duhkham of Govardhana, Hanumaan went to Shri Raama and told about Govardhana. Shri Raama had great aanandam seeing the Bhakti of Govardhana. He gave a varam to Govardhana that he will do Uddharana of Govardhana in Dvaapara-yugam when He is Shri Krishna. For 7 days, Shri Krishna lifts Govardhana Parvatam and saves lifes of the Gopaalas. Govardhana then has great aanandam for being of some use to the Paramaatma Shri Krishna. We must always put in efforts, hard-work for doing a good deed, whether or not it is possible or impossible for us. God will be happy with the Parishrama (hard-work) we put in and bless us immaterial of the result. Though it was not capable of doing much, the squirrel did whatever it could and impressed the Lord. The nishkaama Bhakti of the squirrel and Govardhana must be inculcated. God always protects His Bhaktas, like He did to Govardhana. Padmapaada was the priya-shishya of Shri Jagadguru Aadi Shankaraachaarya. His original name was Sananda. Once Shri Aadi Shankaraachaarya overheard His other shishyas discussing why their Guru likes Sananda the most? What is so great about him? In order to show the Guru-bhakti of Sananda to other shishyas Shri Aadi Shankaraachaarya called Sananda who was on the other side of the pavitra Gangaa-nadi. Shri Aadi Shankaraachaarya said “come fast”. Without any doubt, Sananda closed his eyes and with ananya-bhakti started to run across the Nadi (which will be the nearest route). Then Gangaa-maata made Padmas appear below Sananda feet, whereever he steps and made him cross the river, without drowning. From that day onwards Sananda was known as Padmapaada. Padmapaada was born in Choladesham and right from childhood was a Shri Nrusimha-upaasaka. For Shri Nrusimha-saakshaatkaaram, he did Tapas for many years in Ahobilam, the pavitra Shri Nrusimha Kshetram in Aandhra Pradesh. But Svaami didnt show Karuna. Knowing this, once Shri Aadi Shankaraachaarya, who was then near the Pavitra Phaala-dhaara Teertham in the Divya Shrishaila Kshetram, said to Padmapaada “Putra! Padmapaada! You are very eager to have the Divya-darshanam of Shri Narasimha Svaamy. Time for it has come. Not far from here, there is Chenchuguudem. There is one Parvata-Bilam there. Parvata-Bilams are like Maatru-garbham. They keep Jeevas away from usual Worldly things and make him go in the path of Moksham. So you immediately go there and do Tapas. You will get Mantra-siddhi”. Immediately Padmapaada reached the Parvata-Bilam in Chenchuguudem and started Ghora-Tapas. The King of the Aativikas, knowing this came running to Padmapaada and said, with great Vinayam, “Svaami! My name is Bayanna. I am the Chenchudora (King of Aativikas). This Bhuu-bhaagam is under my control, so just tell me what you are searching for in this place, I will get it to you”. Padmapaada replied “Dora! I am looking for a Nrusimham which has Simham as head and Maanusha-shariiram”. Bayanna replied “Svaami! I know the whole of this forest. I saw many tigers, lions and many wild animals. But I never saw what you described”. Padmapaada replied “It is there here only. However you will not be able to see It”. Bayanna replied “Svaami! If really there is some Thing like what you described, I will bind It and bring It before you, else I will leave my life”. Saying this, he left for searching Nrusimham. Always thinking about the ruupam that Padmapaada had described, leaving Nidra-aahaaram, Bayanna searched all day. But his shrama didnt get any phalitam. So he decided to do Praana-tyaagam. Then seeing the Nishkalmasha-bhakti of Bayanna, Shri Nrusimham appeared before him! Immediately Bayanna tied Shri Narasimha Svaamy with some creepers and brought him before Padmapaada!! “Svaami! See I got What you were searching for. I put lot of effort. Finally I got Him. I tied and brought Him, see” said Bayanna. 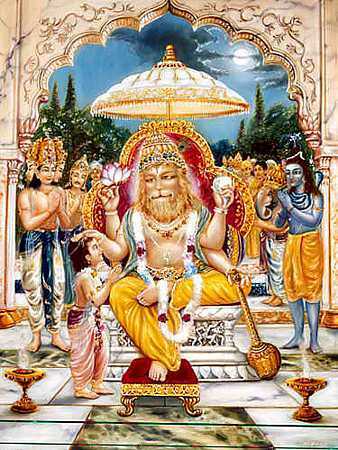 However Padmapaada was not able to see Shri Narasimha. He cried “Svaami! In one day You gave Your saakshaatkaaram to Bayanna. Even though I did Tapas for so many years I am not able to see you?”. “Putra! Padmapaada! The Ekaagrata which even after 1crore years of Tapas is difficult to get, this Bayanna achieved it in one day. Because of you being in his saagatyam (company), you are able to hear Me. Your Tapas gave you phalitam now. You got Mantra-siddhi. 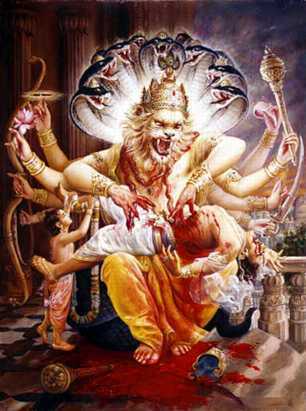 When you are in need, I will Myself come to you” saying thus, Shri Narasimha Svaami dissappeared. Guru-bhakti of Padmapaada is well shown in the story. Without any kind of doubt, Padmapaada started to walk cross the river as soon as he heard his Guru, Shri Aadi Shankaraachaarya call him. Without Guru-bhakti no Vidya can be learnt (see this too). The Nishchala Bhakti, Ekaagrata of Bayanna are well shown in the story. As Shri Narasimha Svaami Himself said, the Bhakti, Ekaagrata which even after 1crore years of Tapas cannot be got, Bayanna got in 1 day. Shivadeva and his Bhaarya were great Bhaktas of Parameshvara. Everyday they used to do Shiva-abhishekam, give Ksheera-naivedyam and do Stotram of Shiva, in their village’s Shivaalayam. Shivadeva never used to leave the village and go, because he was worried “if we are not there, who will do Ksheera-naivedyam?”. His Bhaarya also used to follow him and not leave the village. Once due to an un-avoidable reason, they had to go out of the village for few days. Not knowing what to do they told their priya-putrika to do Ksheera-naivedyam without fail till they come back. They told her many many times not to forget and continue this Vratam. After the Maata-pita left, Shivadeva’s putrika did snaanam, boiled Go-ksheeram, put it in a vessel, covered with a small silk cloth and took it to Shivaalayam. She kept the Ksheeram before Parama Shiva and said “Please take this Ksheeram Svaami!”. She saw that Pinaaka-paani did not drink the Ksheeram. She wondered why? She said “Svaami! Didnt the Ksheeram boil well? It is shuddha Go-ksheeram only Svaami please have it. Did you get angry that I dont know puuja-vidhi and mantras? If you dont like Ksheeram, shall I get some bhakshyas, along with which You can drink Ksheeram? We have Go-ghrutam and Navaneetam too in our house. Shall I run and get them? Shiva! will You eat paayasam instead? Everyday You accept when my Maata-pita do Naivedyam to You. Now why are You not accepting?”. Whatever she did, however she pleaded, Umaa-pati didnt drink the Ksheeram. Finally the putrika thought what is the use of a putra’s life when he cant follow Pitru-aagnya? and started to bang her head against the Shiva-lingam and do Praana-tyaagam. Before that, Parameshvara stopped her and drank the Ksheeram! Everyday the baalika used to bring Ksheeram and Gangaadhara used to drink the Ksheeram. One day, when she was returning from the Devaalyam, she ran into her Maata-pita, who just then returned from the yaatra. They asked her why the vessel was empty. The Baalika replied that Shiva drank the Ksheram. She replied the same on being repeatedly asked to tell the truth. Not believing in her words, they took her to the Shivaalayam, along with a vessel containing Ksheeram and asked her to do Naivedyam. But this time Parama Shiva didnt drink. Thinking that his putrika lied, he tried to beat her. The baalika then did aalinganam of the Shiva-lingam. Before everybody she became aikyam with the lingam. Shivadeva tried to pull her with her hair and some hair was left coming out of the Lingam. Even now, the puujaaris of the Shivalingam do Kesha-samskaaram every 6 months of this adbhuta-lingam. From then onwards the baalika was called Godaguuchi and became famous in the list of great Shiva-bhaktas. The Nishkalmasha-bhakti of Godaguuchi was great. With her ananya-bhakti, she achieved Shiva-aikyam in the end. The importance of Niyamam, vratam is well shown in the story. Shivadeva everyday without fail used to do Ksheera-naivedyam. Discipline is a very important thing that we need to inculcate. There will be many who do Suvarna, Go, Bhuu daanam; but it is rare to find one who has sarva-bhuuta-daya. One day, when Raghu maharaja was doing Tapas, a Viprottama approached him and asked for Sharanam. Seeing the Viprottama, who was trembling with fear, Raghu maharaja gave Abhayam and asked the reason for the fear. Meanwhile a Raakshasa came there saying “leave … leave”. He said to Raghu maharaja “Raja! leave him. This is the aahaaram that Brahma decided for me. Why are you protecting my aahaaram. I am very hungry”. Raghu maharaja said “I will not. He, that too a Viprottama, came to me and asked for Sharanam. A sat-purusha always gives Abhayam to a Sharana-arthi. Also it is my Kshatriya-dharmam to protect this arthi. A person who does Abhaya-daanam will get more punyam than one who does all Yagnyas-Vratas. How can I cheat a person, to whom I said even giving my life I will protect you? For any paapam there might be a praayashchittam; but not for a Sharnaagata-hanta. I can get you any other aahaaram which you will like. With hunger how much you are suffering, this Vipra is also suffering that much with fear”. Raakshasa replied “Like a Gnyaani you talked a lot about anya-samrakshana-dharmam. However you wont care about my hunger. When the tastiest food I want is before me, you are asking me to ask for some other aahaaram. Now if I die of hunger wont you get the paapam? Raja! you dont have daya. For Tapas, daya is the basis. Nirdaya gives paapam. Please save me – who is suffering from hunger. Leave the Vipra”. Raghu maharaja then thought like this “If I leave this Vipra, Raakshasa will eat him. If I dont, Raakshasa may die of hunger. Without any doubt in either case I will get the paapam. What do to?”. Then he remembered his Guru, Vasishtha’s bodha — “Hari naama smaranam is the only way in case of difficulties”. So Raghu maharaja, with nishchala chittam, did Shri Hari dhyaanam and said “Paatu maam Bhagavaan Vishnuh”. Just on hearing the Hari naamam, the Raakshasa got Divya-aakruti and said “I am a King by name Shatadyumna and got this ghora-ruupam because of Vashishtha maharshi shaapam, for my dushkaaryam. Because of hearing to Divya-Hari-naamam that too from a Dharmaatma, Tapasvi like you, I got Vimukti”. The Vipra also reached home safely. Seeing this, Brahmadeva appeared before Raghu maharaja and said “O Mahiipaala! your Dharma-vartanam impressed Me. Please aboard this Divya-vimaanam and come to Satyalokam”. This Divya-gaadha was told by Shri Bhrugu maharshi to Shaunaka mahaa-muni. Bhuuta-daya and Sharanaagati-dharmam are well shown by Raghu maharaja. The Punyam got by Abhaya daanam is anantam! For such a person, Satyalokam is easy to reach. The importance of Shri Hari-naama-smarana is well shown in the story. Especially in Kali-yugam, Naama-sankeertanam, Daiva-bhajanam is the easiest way for Mukti. There used to be a sampanna-graamam near Devagiri in Southern Bhaarata-desham. A Braahmana by name Sudharma used to live there. His patni’s name was Sudeha. Sudeha was sad because they didnt have any santaanam. She then arranged Kalyaanam of her sister, Ghushma and Sudharma, hoping to get santaanam. 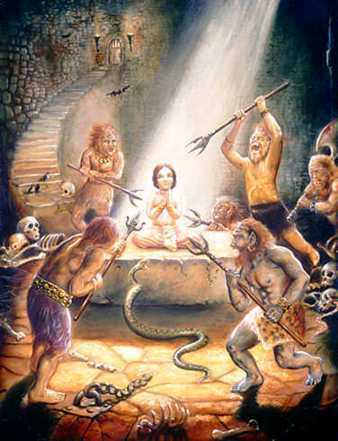 Ghushma was a great Shiva-bhakta. She used to do archana of 101 Paarthiva-lingams (Shiva-Lingam made of sand) everyday. On a sumuhuurtam, Ghushma gave birth to a boy. Everyone was happy. But the happiness didnt last for long. Many used to give more respect to Ghushma than Sudeha and used to say Sudeha was a Vandhya (woman with no children). Slowly Iirsha and Asuuya started in Sudeha on Ghushma. Meanwhile the kid grew up and Sudharma did his Kalyaanam. The putra (son) and snusha (daughter-in-law) always used to respect Sudeha and look after her with prema. Similarly Sudeha and Ghushma also loved her. However because of Iirsha and asuuya, Sudeha’s heart was burning. Finally Iirsha turned into Matsaram and one night she went near the newly married couple and killed the putra when they were sleeping. She then cut him into pieces and put the body into a kuupam where Ghushma used to put Nirmaalyam and used Paarthiva-Lingams! She came back and slept peacefully as if nothing happened. Next day morning Sudharma and Ghushma were inolved in their Dina-charya and Sudeha was in kitchen acting as if nothing happened. But the snusha, to her terror, found that her husband was missing and she saw blood and flesh pieces. She tried to tell Sudharma and Ghushma, but they didnt respond as their were completely immersed in Daiva-dhyaanam. When Ghushma was returning after putting that day’s Paarthiva-Lingams in the kuupam, she saw her putra walk towards her! At the same time Parama Shiva gave His divya-darshanam to Ghushma and told her to ask for a Varam. Ghushma said “please appear here as a Jyotirlingam and bless all of us”. Immediately Parama Shiva took the form as “Ghushmeshvara Jyotirlingam” (one of the 12 Jyotirlingams). 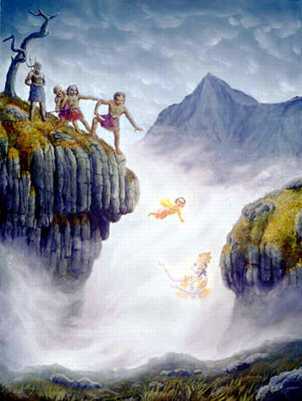 The Kuupam became a Pushkarini by name “Shivaalayam”. Iirsha, asuuya and Matsaram are very terrible. They change even a woman, with Komala Hrudayam into a Kathinaatma. Sudeha, who herself did Kalyaanam of Ghushma and Sudharma, developed Iirsha and finally did Mahaa-paapa kaaryams. Bhakti of Ghushma and Sudharma are well shown in the story. Nothing disturbed them, they had 100% belief in God. God always protects such Bhaktas.